At the weekend we covered claims from Marca’s editor about Paul Pogba and a potential Manchester United exit. 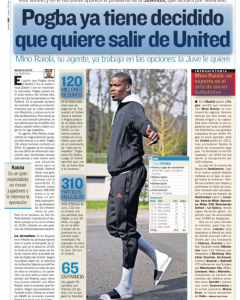 It was reported that Mino Raiola is already aware of what his client wants to do, and that’s leave Manchester United… with a preference to sign for Real Madrid. Marca explained this fits in well with the agent, who has been trying to tempt other clubs for a while. Madrid have been interested, but the Spanish newspaper made sure to say the finances of a transfer would make it very difficult to complete. Monday’s edition of AS has a similar take. They state Pogba has ‘already decided’ to leave Manchester United, Raiola is working on the potential options and it’s claimed a return to Juventus could be a possibility. Zinedine Zidane returning to Madrid means that Pogba is back on the agenda, according to the claims, and AS state the player’s comments about the club being a dream were a ‘calculated move’. Pogba has already rejected a renewal offer, explains the report, wanting time to think about his future. It would take a ‘great offer’ to get him to sign a new Manchester United contract, and if he doesn’t then it’s believed there’s pressure on the club to sell because they’d be in an ‘inferior position’ to do so in 2020. That seems to be because AS believe the player’s contract ends in 2021, although there is thought to be an option to renew that for a further year.